The unique nature of the «Fantasia» duet’s style lies in the effortless and elegant performance of acts. Supreme level of performance mastery, excellent appearance, radiant smiles and a world of charm. A true jewel of any concert! «Fantasia» duet — Natalia and Andrey Mitin. There was never a doubt that Natasha will become an artist. She was keen on making home performances since early childhood, sang and danced very well. She dreamed of becoming a ballet dancer and practiced several years in the Classic dance studio under guidance of the Honored artist of the Russian Federation Gennadiy Vasilyevich Ledyakh. Her first success was performing Masha’s part in the «Nutcracker» ballet. Since early youth, Andrey was a serious practitioner of artistic gymnastics and his first professional achievement was fulfilling the sub-master sportsman qualifying standard’s requirements. It was his first true success. 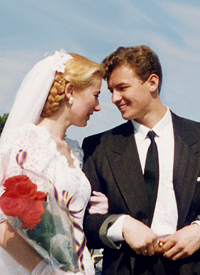 In 1985, Natasha attempted to enter the Moscow Choreographic Academy , but failed the third level admission exams. It is curious that Andrey too received an invitation to the same academy in the same year, but his trainer insisted on him continuing the sports career, since he was very promising. Back then, in the childhood, their meeting was not meant to be, but fate seemed to lead them towards one another. They met in 1989, when both entered the State Academy of Circus and Stage Art named after M. N. Rumyantsev (Karandash). The first and mutual love united them once and for all. After graduation in 1993 they formed a union of two hearts, in which life and art merged to form a single whole. 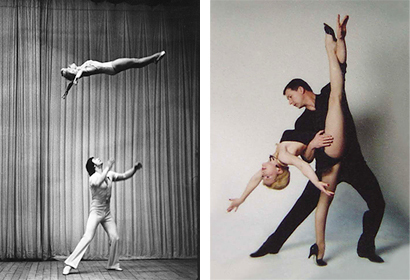 Within the same year the young pair was hired by «Mosconcert» to perform the act «Acrobatic sketch». It was evident that the duet will have true success with the public. Gradually, their repertory was extended by new acts and the duet got a name — «Fantasia». Constant rehearsals, self-cultivation and the urge for perfection brought performers to the world-class mastery level. The artists worked a lot and were very successful both in Russia and abroad. The duet began to receive invitations for large and significant events: The Moscow Day on Poklonnaya Gora, The Victory Day in Kremlin, large Holiday concerts on the best stages of Moscow. You might see them on a city square during celebrations, in the «Russia» concert hall, in the «Estrada» theater during recitals, as well as in the broadcast of a Holiday concert. The artists have a large tour schedule. Spectators of many countries applaud them. However, the creative duet experienced a very special reception in the USA. Every year the artists are invited for a tour all over the country, where the Russian school of ballet dancing and circus are so sincerely loved. Year after year, during the sixteen years of performing on all possible stages, the «Fantasia» duet has gained a great professional experience. Bright and cheerful, true masters of their trade — they are invariably successful with any audience. «Fantasia» duet is currently working on a great variety of creative plans — among them interesting proposals from directors for staging of new acts, offers for participation in TV projects and festivals. Natalia and Andrey are representatives of the second generation on stage. Natasha’s parents have been famous original acts performers in the past. Master sportsmen in acrobatics, prime performers of Mosconcert — Tamara and Sergey Kotlyarov. They are now busy bringing up the young, passing on to them the priceless knowledge of their genre. Natalia and Andrey have two wonderful sons. Maybe they too will follow the path of their parents, so that a dynasty of magnificent artists would bring happiness with their mastery to spectators of the next generation!